Refined deodorized frosted sunflower oil is made from selected sunflower seeds. The technology of its preparation maximally preserves natural useful substances of vegetable origin. High-quality cleaning completely removes any impurities from the product which are the cause of burning and unpleasant after-taste. 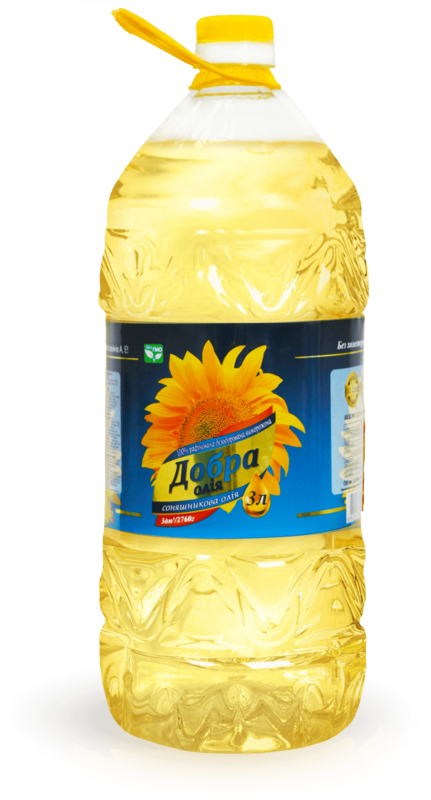 Sunflower oil is an indispensable product in the home kitchen, in the food services, and in certain industries. It is impossible to prepare meat, fried potatoes, fish and preservations without sunflower oil. Also, we always use it for marinade sauce, salad dressings, and mayonnaise. Its unique composition helps to increase human immunity, remove cholesterol, strengthen the walls of blood vessels, saturate the body with a whole complex of vitamins A, D, E, and F.
The consumers can buy our products packed into convenient polyethylene containers of various volumes (840ml, 1l, 1.8l, 3l, 5l). High-quality plastic provides the possibility of a safe long-term storage of oil. The label indicates all the necessary information about the composition, nutritional value and shelf life of the product. Material - laminated carton. Differs high strength and density. Used to the better safety of the goods. Standard - 6 pcs in box. The number of boxes in the container - 1500 psc. The number of bottles in the container - 9000 psc.